We've got a new feature in the game and we can't wait for you all to try it! Introducing, the Daily Gliddle Gift! 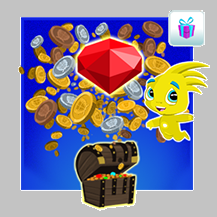 At the start of each week, you will have the chance to play for random gifts and resources to use in the game! All you do is click the Daily Gliddle Gift option located in your Activity List and select the "Click to Play" button. You will activate the spin and watch as your daily prize is selected! Come back each day of the week to collect all the gifts for that week. We hope you enjoy this new feature! Glide On!